We had a wonderful Christmas. Bro came down, brunch at our house, dinner at my mom's. All the food was fresh and absolutely delicious! 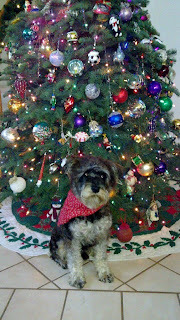 Here's a picture of Gino in front of the tree. He wasn't quite sure what to do with all the strangeness going on. He got worried enough that he didn't eat breakfast Christmas morning. However with fresh turkey scraps mixed in at dinner, he scarfed that down! One special present I got was a hand knit scarf from my mom and knitted by my cousin. My cousin knitted gorgeous scarves for my mom and I earlier this year with some wonderful yarn we bought at a show (and found some more at a local shop - Black Sheep). We loved the scarves so we bought some of this yarn (in gorgeous lavendar/grey/white) to send to my cousin for a thank you. I REALLY liked that yarn too. My sneaky mom bought some more and sent that to my cousin to make me another scarf. It's gorgeous - and I need to get a picture with it on. Ho Ho Hell has arrived! Yay - the rains have come! It was a rainy, blustery day today and tonight the blustering of mother nature continues. It is a wonderful change from our normal dry, sunny weather. We need rain so badly here - hopefully it is coming slow enough so it can start sinking into the ground instead of running off into canyons and streams. Gino and I went walking in the rain. He didn't care and I was all bundled up so neither did I. We turned on the fireplace to dry out and Gino loved it! He was quite happy to take a snuggly nap in the basket next to the warm fire. I love having the fire place going - it is an added benefit to cold, stormy weather. 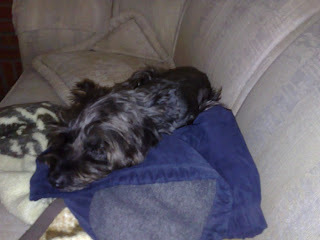 Now Mr. Gino is napping on the couch with a Tony t-shirt keeping him warm. The fireplace is going again (the benefits of a gas fireplace - instant on and off!) so the family room is getting warm and comfy. 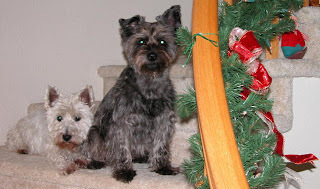 Our dog Kirby crossed the rainbow bridge today and should be romping with his "bro" Oscar - both of them healthy and full of energy again. We almost lost him about 5 months ago - but he wasn't quite ready for the great beyond. He came back with a small roar despite the tumors in his little body. Unfortunately he eventually started losing control in his back legs (either his arthritis got a lot worse or tumors were spreading) and for the last 2 weeks he has been on pain pills. 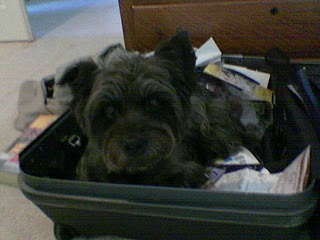 We got Kirby way back in 1999 - not too long after we got Oscar. 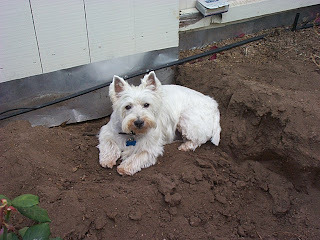 He was 5 and was saved from a not too caring owner by Westie Rescue. 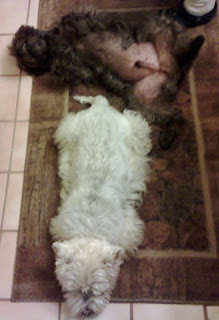 When they got him his front legs looked like hamburger because his skin allergies were so bad. They got him all healed up and we got to adopt him. 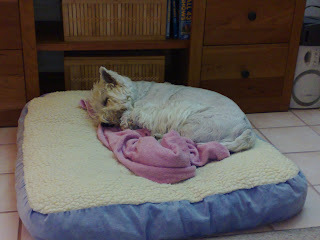 In my research on the web I found some information linking Westie skin allergies to high protein. 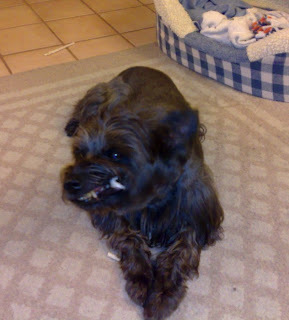 We put him on a low protein diet (Nutro Lite food was the lowest protein percentage I could find) and his skin problems only showed up when he managed to sneak some of Oscar's food. He absolutely adored Oscar! In their younger years they enjoyed wrestling together and sometimes even played tug-o-war with each other. Kirby was the only one who could get Oscar to play. Kirby also managed to need a surgery I hope I never need - he had to get the doggie equivalent of an ACL repaired. 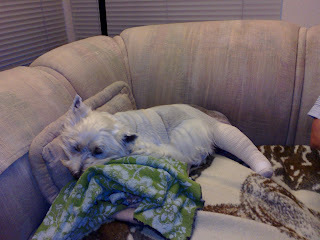 Here he is with his leg all bandaged up and enjoying his favorite activity - LOL! He loved to play with toys - often by himself. And some of his favorites were some tug toys I got at the $1 store - the pink pig was especially cute against his beautiful white coat - whether he was playing with it or using it as a pillow. 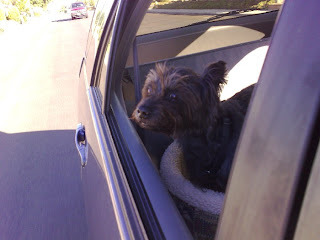 We sure miss our little old man - but I'm glad we got another 5 months with him so he could teach Gino a few things - like how to really enjoy a car ride by smelling out the window! 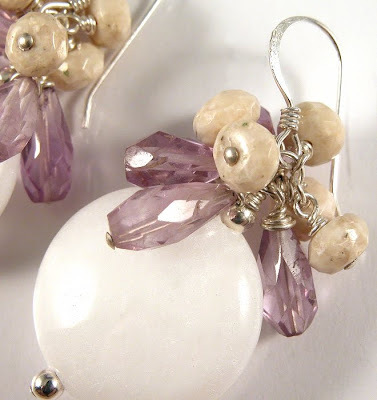 Got my consulting work done and once the customer gives it a try I should be off the hook until after Thanksgiving! 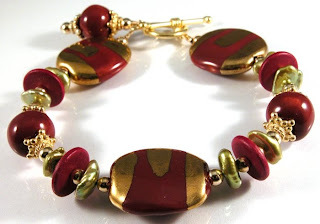 Finally designed a new bracelet - YAY! I've been in a bit of a slump. 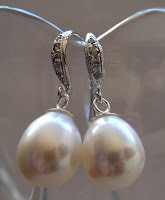 Partly due to the gem order I had to sort/ship, part due to losing Oscar. Now to just finish it off, take pics and get it listed! Gino continues to entertain us! I have yet to successfully keep him locked into the kitchen when I leave. Today I put up all the crunchable/edibles but he managed to find a plastic cup Tony had and left teethmarks in it, moved one of Tony's shoes, pulled some OLD paperwork out of a file on the table and partially shredded it - I put all of it in the shredder since it is actually trash. He also found some headphones somewhere - I forgot to ask Tony where they came from ... This time he jumped over the barrier that didn't have chairs in front of it. Sigh! I still have no clue what breed he is exactly. Schnauzer I'm sure - but he has real curly hair from some other kind of terrier. I also got to watch my friend make a bowl/plate at her glass lesson. I can't wait to see how the color comes out. It was fun watching her make it. I got to help with a little blowing in the pipe. 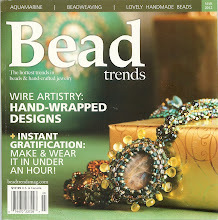 Her instructor is Kathleen Mitchell and she makes GREAT glass gourds. I picked up 2 more for Tony's mom - in blue - which we'll be taking up to her. Hopefully she likes them! Let's see where we're at with Gino's personality development. One thing I know - if he has been outside by himself for a while and is being quiet - go see what he's up to. LOL! He's a sometimes digger. I found a rather deep hole he dug while hubby was talking on the phone nearby. It was about 8" deep and probably 8" wide. I have no idea what he was digging for. Tonight I go check on him and find him lolling in the grass chewing on a bone. I have NO idea where he got a bone (a neighbor must have tossed it over the fence for some reason) but he was having a great time with it. Needless to say I took it away and threw it out. We went to the dog park today and Gino had a blast running!!!!! Kirby had fun too - he refused to sit still with me and wanted to go sniff dogs and many points around the dog park. They are both exhausted and Kirby is having tremors so he really overdid himself. After giving him an anti-inflammatory pill and some honey the tremors seem to have stopped. 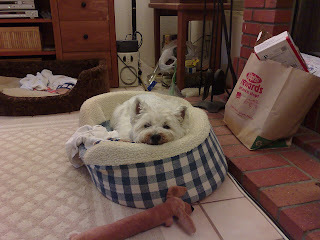 I don't know if I'll take him there again since he seems unable/unwilling to just lay down, relax and be an old dog. He had fun, but he's paying for it tonight. I do need to remember to take pictures though! Gino runs flat out - all legs stretched and extended to the max. Oscar used to tuck his tail (or what bit of it was left) under him and ran low to the ground. Oh wait - and he has the potential to be an escape artist. He did get out the front door today when I wasn't being too careful. Fortunately he stayed on the front porch and when I rattled the leash he ran back into the house. I MUST be more careful when going out the front door. Hopefully he won't figure out he can dig a hole under the fence and get out that way. 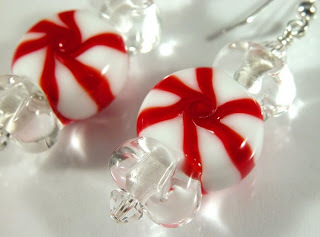 It is also fun to find what unique items are available for sale on Etsy and especially when you're looking for a particular type of something. Gino's personality is asserting itself more and more as he feels more secure. He's rolling over for belly rubs, loves his walks, will jump up so I can lift him into the car, ... He was left alone at my mom's house (with 2 other dogs so he wasn't lonesome) yesterday and didn't get into too much trouble. Today he'll be left home with Kirby while I run some errands so I can see how he does at our house. I'm guessing he's going to knock down the barricades but I'll close up all the rooms where he might get into trouble and will pick up any trashcans that he might find of interest. Hopefully he'll just hang with Kirby and take a nap. Fortunately he learned how to use the dog door and knows to do his business outside so the house training finished up pretty quickly. We added to the Estrada pack yesterday. I dragged my hubby to see Gino yesterday and I couldn't resist such a cute terrier and Tony couldn't resist me - LOL! So Gino came home with us yesterday (after a trip to Costco). Today he got to spend time with my mom and her dog Becka since both Tony and I had to play our respective sports (baseball and soccer) and I did not want to leave him by himself when he hadn't even been with us 24 hours. 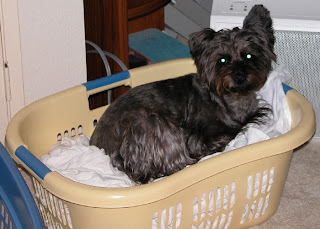 Here's a picture of him tonight in one of the many dog baskets we have scattered throughout the house. He is quite a basket boy - he probably didn't have one down in Baja. He's starting to play too. Tonight he decided he didn't like me being upstairs and Tony being downstairs so he would grab an upstairs toy, give me a little growl and when he saw I was coming over to see what was up he would run downstairs with the toy. The first one didn't get me downstairs so he did it again. I followed him downstairs and played tug-of-war with him for a while. Then we ALL went upstairs and he was more content. LOL! We're still working on getting him to use the dog door too. He doesn't nudge any doors with his nose so I think it will take a while to teach him how to use it. Ah - finally cool weather in San Diego. I'm loving the coolness, but not the switch off daylight savings time. 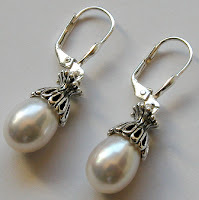 It just doesn't seem right to leave my jewelry class at 5:30 and it's almost dark. Icky! I've been doing OK after losing Oscar - at least on most days. Today was a tough one. I had to go to the vet to get Kirby some pills and the only thing I thought of to/fro was our last trip to take Oscar there. Needless to say it was a sad trip and I'm still down in the dumps. 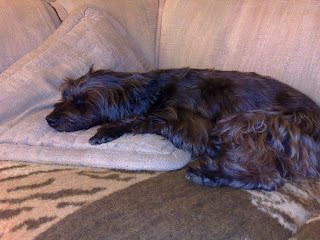 I'm going to check out a rescue dog tomorrow - Gino, from the Baja Animal Sanctuary. He seems like a cutey and I can't resist a terrier. The first requirement will be that he can be gentle with Kirby. I don't want Kirby's last days to be messed up by a new dog - so if we get one it will have to be gentle and nice to our "old man" Kirby. If Gino is too energetic I've seen a couple of possibilities at the pound as well. I have no doubt that when the time is right we'll find the right dog to give a new home to. 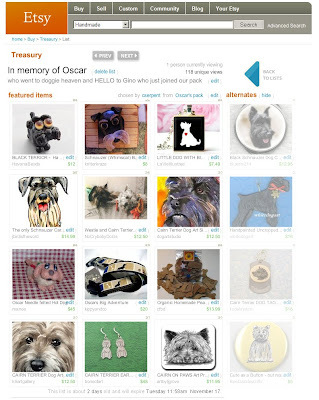 That's the best way to honor Oscar's memory - give another loving doggie a good life with a new pack. I can't wait for tomorrow or the next day when it is supposed to cool down. It's still hot today here in very sunny San Diego. Hopefully the heat, dryness and back country winds don't cause another fire problem. 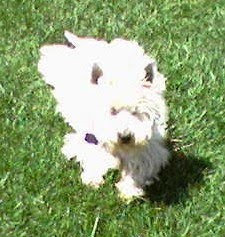 I've been looking at cute little terriers on http://www.petfinder.com So many cuties to see! I have to resist though and give Kirby the love/care he deserves until he goes off to join his bro. 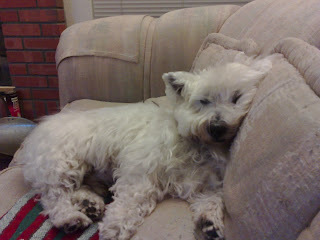 Who knows when that will be though since he is a tough, old Westie! I may have to visit the pound/humane society compound regularly though. It takes a while to find terriers at those places and they get less press than the rescue groups do. 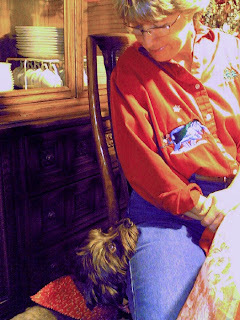 Oscar was a scared, timid, loving little 15 pound dog when he came home. 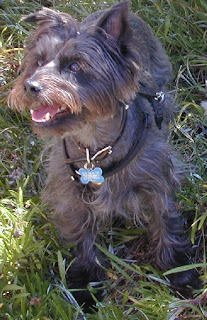 From his looks we think he was part Cairn terrier (one little girl who saw him during a walk said his face looks just like Toto in the Wizrd of Oz) and Schnauzer. 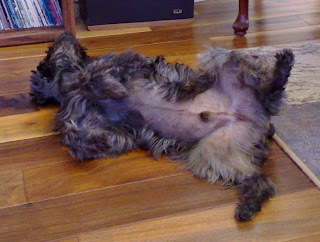 His torso was definitely all Schnauzer. His hyper personality when outside the house matched both Cairns and Schnauzers. He had a lot of anxieties when we got him. He would throw up every time he went for a ride - probably thinking we were taking him to the pound. He would start panting and salivating anytime he was locked in a cage. He eventually came to love rides - but never could handle being in a cage. Ah one episode we've never forgotten. Just a few days after we got him Tony brought home a "monster" burrito from his favorite Mexican fast food restaurant. He cut off about 1/3 for himself and left the rest on the counter. We were sitting in the family room and heard a rustling coming from the kitchen. We peeked around the corner and there was Oscar greedily eating all the chicken, beans, cheese out of the rest of the burrito (and carefully leaving behind all the lettuce and rice). We started cracking up - and that scared him. I'm sure he thought he was in trouble. We just had to laugh because Tony had left a corner of the wrapping paper hanging over the counter, Oscar smell YUMMIES and since he was very underweight he was also very hungry. Yummies were in reach so he snagged them! We let him finish up the burrito. That was the only time he ever did something like that - but then we gave him as much to eat as he wanted since he never would eat enough to get fat. He was empathetic (or he liked the salt in tears) since he would always come up to lick my face when I was crying - no matter how quiet I tried to be. If he found something interesting in the yard (snake, dead or dying rat, ...) he would find a way to let me know there was SOMETHING TO SEE!!!! Come SEE!!! 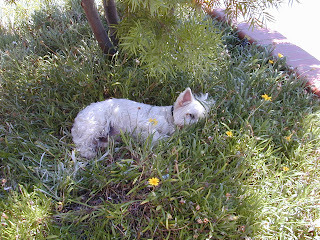 He definitely had the hunter instinct - he LOVED to chase lizards, rats, squirrels, cats, rabbits ... He only got the tail off of one lizard in all his "hunts" but he never stopped trying. I remember one time when the fountain in our yard was running and something was making bubbles form and pop on the surface of the water. Oscar would stare intently at the bubbles and touch them with his nose to get them to pop. The pop would startle him but he would continue to watch the bubbles with seeming fascination. Another thing he would regularly do was walk up to you and put his chin on your leg hoping for pets or treats or ... He was such a cutey when he did that! His "brother" Kirby absolutely adored him, but not so much in the other direction since Oscar was attached to me more than anyone or anything. 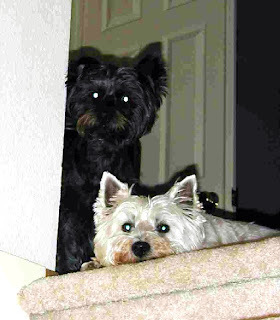 Nevertheless Oscar would not play with me but loved to wrestle with his brother. My mom has a bed with a big space underneath and Oscar and Kirby would play with Kirby under the bed and Oscar trying to "get" him from outside the bed. Kirby would also try to keep up with his buddy during walks and play time out in various fields. He couldn't run or walk nearly fast enough, but he would sure try! I guess that's a recurring theme that we can all learn from dogs - keep trying and enjoy the effort! Oscar absolutely LOVED to run. Unfortunately his hunter instinct meant I couldn't let him run unless it was a fenced in area since any rabbit or squirrel would send him chasing. 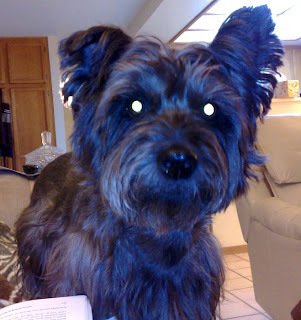 When I was working long hours I used to take Oscar and Kirby for walks late at night and for a while I would let him run off leash since not too many cars were driving around at 10PM in our neighborhood. Well one night he saw a rabbit and followed it under a gap in the canyon fencing. Fortunately I could hear his collar jingling as he chased that rabbit around the slope of the canyon. Fortunately I still had a hold on Kirby. Eventually Oscar tired of the chase and decided he wanted to come back. It took a while to get him to come back near the hole he scurried under and then get him to crawl back under. After that little scare (we do have coyotes in the canyon!) I no longer gave him the opportunity to run around our neighborhood. Despite my careful watching Oscar would sometimes scoot out the front door when someone gave him an opening. Fortunately he would usually come home fairly soon or would eventually come running back to us when we went looking for him. A few times we had to get in the car and go looking for him and then he would RUN into the car so he could go for a RIDE!!!! Tony's mom and dad came to visit us once and didn't really know about his escape tendencies so they left the door cracked as they went to get their luggage. Sure enough - Oscar was off and running like a shot. They couldn't believe how fast he got out - LOL! So they dragged the bags in and by the time they came back to the door to go out looking for him he was already back, sitting at the front door, happily panting and waiting to come back in and say HI! Boy were they surprised. Here he is enjoying a ride. 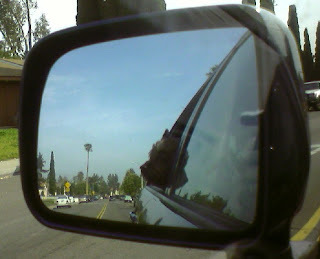 It was really a sight in the side mirror when he and Kirby were both sniffing out the window. Over the years Oscar had many health problems. Apparently he was a mutt who got a lot of the bad genes from his parents. We had his hip socket fixed when his back leg kept popping out of its socket. Now if this happened while he was running he didn't stop - he just kept running on 3 legs. Something in his early years made him quite paranoid about cages. He would totally stress out anytime he was put in one. When I took him in for his leg surgery I asked them to just tie him up outside the cage so he wouldn't get so stressed. They didn't do that initially and even in his post-surgery drug hazed he managed to push hard enough on the door to get it open and he fell out. When I heard that I told them they HAD to keep him out of a cage and he would be fine. They finally put a pad on the floor and tied his leash to a cage and he stayed quietly in place until I came to pick him up. I took him home, with his 3 good legs and one bandaged leg and a bag of meds. He was still in a drugged stupor so I figured it would be safe to leave him on the front porch in his basket while I went to get the rest of his stuff out of the car. Silly me! When I returned to the front porch with everything in hand there was no Oscar in sight! I couldn't believe he walked away! So I went looking for him and found him already out of our court and staggering down the street on our normal walk route - LOL! Even a drugged stupor and three legs couldn't keep him down. He also had regular ear infections. One finally got so bad that he ended up going to the doggie ER. At the time I had no idea it was his ear. He was throwing up and couldn't walk. Unfortunately this started on a Saturday and our vet wasn't open on Sunday. I did get some liquid food from the vet on Saturday in hopes he could keep that down. By Monday it hadn't stopped so I tried our vet when they opened and found the doctor wouldn't be in for another hour. Since Oscar was so dehydrated and doing so bad I just took him to the ER. After quite a bit of time waiting and discussing various possible issues they asked if he had any ear problems. I told them he had regular ear infections so they looked into that as a cause and sure enough he had a REALLY bad ear infection. Since it was recurring and he had not been able to find any root cause my vet asked them to recommend a specialist to look into it. They suggested I try an allergy vet and fortunately they had an opening that afternoon. So they pumped Oscar up with subq fluids (he looked like he had 2 saddle bags on either side of his back) to reduce his dehydration until I got into to see the allergy vet. The allergy vet was very helpful and immediately could tell what his problem was. We scheduled an ear surgery for the next day so they could go in and clean out the ear and see how bad it was down deep inside. Fortunately they did have some anti-nausea medicine so he could eat. But until they cleared out the ear his dizziness would continue. It turned out his infection was so bad it burst his ear drum. Once that got cleared up we did testing and found out he had allergies to a lot of the things I'm allergic to - LOL! So we started giving him allergy shots and with that a few key meds we kept his ear problems under control most of the time. He passed away quietly yesterday morning surrounded by his pack. 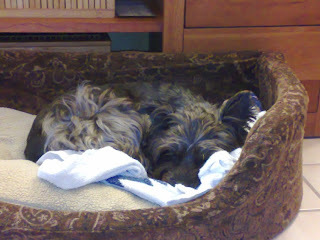 I miss him tremendously and keep expecting to hear the tick-tick of his little feet on the tile behind me. I know he's off playing with my Dad (who he never met) and Tony's dad (he would always stick his head under big Tony's hand to get a pet), but I wish he was still here being my little shadow.